March 27 was National Paella Day, so in honor of this fantastic holiday, I’m going to share a recipe! (OK, so it’s probably a made-up holiday, but what better excuse to share a paella recipe?) Our family has roots in Spain, and we love paella! My suegra actually has a family tree written out on a huge parchment scroll tracing back every generation to before they arrived in Mexico via boat from Spain. It blows my mind that my name is now on that scroll and someday, my children will be on it, too! I’m a big genealogy nerd, so I love digging into our family roots and learning as much as I can, especially when it comes to cuisine! To learn more about Spanish cuisine, I took a paella class with Chef Tim Cottini at Chicago’s Café Ba Ba Reeba, one of our favorite places for Spanish tapas and paella. I learned a lot of new tips to make my paella GREAT. I’ve made paella in the past at home (and you may recall we ate it in Cuernavaca once at a dinner party), but it was never what I’d call awesome. I experimented with different ingredients and portions but it lacked something. I suspect in part because I never had a proper paella pan. When I recently made a recipe that I learned in the class at Café Ba Ba Reeba, it had José begging for seconds. He ate the leftovers the following day and said he couldn’t wait until I made it again. 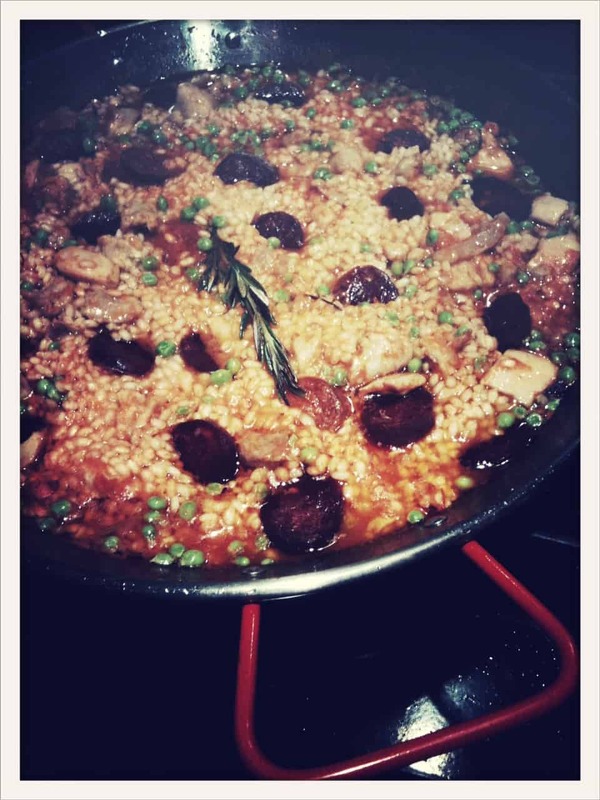 This recipe is my version of a recipe shared in the paella cookbook that I received while attending the class. I also purchased a paella kit that included a proper pan, Spanish smoked sweet paprika, olive oil, bomba rice and saffron. This is a spin on a typical paella Valenciana (which is commonly served with rabbit). Get a REAL paella pan. It’s important to cook paella in a shallow pan. You want one that is thin gauge steel that has dimples in the bottom. The rice in your paella is key. Don’t use regular white rice or boxed Spanish rice. Use rice that is specifically for paella, such as arroz bomba, which is short and round. If you can’t get it, you can substitute with arborio rice. You can also buy it online if you can’t find it in the store! Use QUALITY olive oil for your paella that could stand alone (such as for dipping bread). The oil should not be bitter. Don’t use cheap grocery store olive oil. Saffron can last 4-5 years if stored properly. It doesn’t really go bad, but it does dry out over time so if your saffron is on the older side, you can just use more of it. Quality saffron is expensive; don’t be fooled by the cheap stuff. Heat your saffron in the oven for a minute and then steep it in a little warm water or chicken broth to release the fragrance and flavor before adding it to your paella. With fish or seafood paellas, sear for flavor and remove from heat. Place on a plate to rest. When paella is three-quarters of the way done, place fish or seafood over the top and finish cooking. This way, your fish or seafood won’t be overcooked. With clams or mussels, heat the pan and cook them until they smile (they will open just slightly) and remove; add them back in once the paella is almost done to finish cooking. How to make a classic, typical paella Valenciana with chicken and Spanish chorizo. Paella is a dish native to Spain, but is also popular in Mexico. In your paella pan, heat the olive oil over medium heat on the stove and sear the chicken until it browns a bit. Preheat your oven to about 300 degrees Fahrenheit. Place 10 threads of saffron in an oven-proof baking dish and place in the oven for about 1-2 minutes, then add about 2 tablespoons of water to the dish to steep the saffron and set aside. Add the garlic and stir for about a minute. Sprinkle the paprika over the chicken. Pour the tomato puree around the edge of the pan all the way around. Let it cook for a minute or two. Add the rice and chicken stock; stir until the rice is completely moist. Add the saffron and the little bit of water that you steeped it in. Add the peas over the top. Allow it to cook for a few minutes until you see the rice rise and then sprinkle the salt over the top and embed the sprig of rosemary in the middle, tucked into the rice. Turn the heat to medium low. After about 10 minutes, tuck the pieces of sliced chorizo into the rice. Continue cooking until the rice is soft and the socarrat has formed along the bottom of the pan. You'll know the socarrat is forming when you hear a little crackling noise. (Socarrat is the yummy, crunchy sort of caramelized crust of the rice that sticks to the bottom and is the prize of the paella party!) Don't be discouraged if you aren't able to achieve socarrat perfection on your first try; it takes some practice to get it right. Remove from the heat at let the pan rest for a few minutes before serving. Actually my husband is the paella chef in our house and he would love a new recipe. He makes a fabulous Paella de Mariscos! I am hungry just thinking about it! My favorite paella is mixed! I want to make it for my daughter. I acctually just made a vegetarian paella for some vegetation guest we had over last weekend. It was good but not the same for me. I prefer chicken, chorizo, shrimp, and mussels. I would love to try other types. I grew up going to Spain every summer and it was always my favorite food! Thanks for the great post! OMG love paella! I love the paella that has e-v-e-r-y-t-h-i-n-g in it, you know? chicken, chorizo, red peppers, seafood, etc, etc. 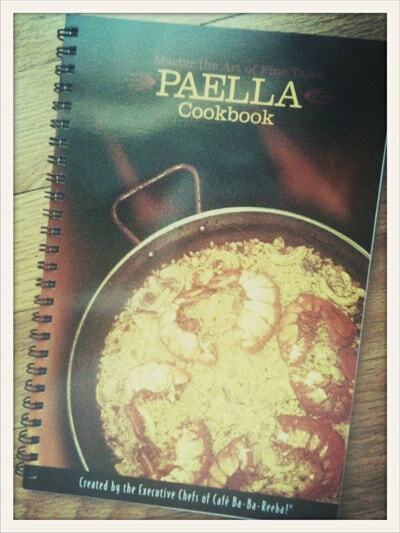 I’ll make it for my whole family, my husband loves paella as well! My favorite is seafood paella, then would be chicken and chrizo. I would cook it for my ex-boyfriend. He’s my ex but we are still friends and I used to make me laugh when I would say I was cooking Paella and he would say ‘para quien’ I would say paella, so on back and forth. I love paella, but have never attempted at making it. I would love a book that could help me give it a whirl. I saw my comadre Martha Stewart make paella outside on a huge fire pit and had a big group of people to enjoy it with her. I think that’s what I would do. Make a big pan of it and woof it down with tons of Sangria….I just got a new camera and would definitely document the entire process too…. I love paella, with sea food yummii. I will like to cook for my husband. I never try before to cook paella i get afraid to many ingredients and steps. I love paella! My favorite version is with chorizo and clams. It’s simpler than the ones loaded with seafood but I love the combo of clams & chorizo. Thanks for the recipe & tips. Chicken! My step-mother in Spain makes one to die for. I would make it for ME and my kids. (My husband is not a big rice eater, but I’d make him eat it anyway.) Thanks, Maura! This post makes me happy. I took the class at Ba-Ba-Reeba last year and LOVED it! I was always so intimidated by the thought of making paella, but the class made me realize how easy it actually is. I make it all the time now. My go-to is chorizo, shrimp and chicken. Yum! I learned to make paella from a friend from Madrid with ham. I never was able to figure out what kind of rice she used so I stopped trying to make it. I love both kinds seafood and chicken. I could use it for out anniversary dinner coming up! The combo chicken and seafood. my favorite is shrimp—omgoodness-i would love to win this!! WoW, that book looks so authentic! I’m practically daydreaming about Granada, my second home. Thanks, Maura for the opportunity for this giveaway. I already feel like a winner just writing on this blog. I may take the class…I love their new brunch menu. The french toast is delish. Anyways, here’s a link for the vegetarians. I would add some organic spinach…I’m already booking my flight to Andalucia. My host mom would cook this for me every other week. The Alhambra is calling me home.